Houses in Art is a look at houses as they appeared in the works of artists. Old paintings and other types of art are a little like a historical record of the world around the artists. This article doesn't attempt to be scholarly, nor does it go into great detail. It is just an attempt to see what we can glean from old paintings, while having a bit of fun and enjoying great art. The photos presented tend to be rather large, so the article spans several pages. 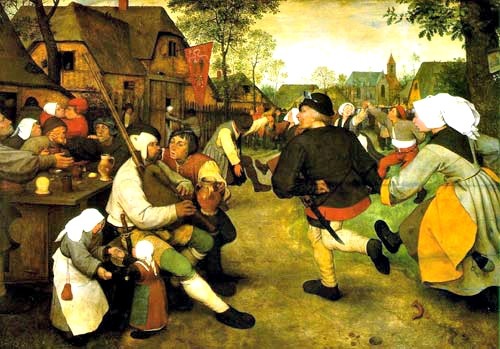 Pieter Bruegel the Elder's Peasant Dance, ca 1567. The most prominent building in the near background is probably a tavern, but the other buildings of the same style appear to be homes. The roofs appear to be thatch and they have a curious clipped gable. It is hipped at the very top, rather than coming to a point. If you look closely you can see some vertical bands on the house. This should be the alternating strips of wood framing and plaster common in timber frame houses. There isn't much detail, but we can see that the houses have a natural color. No whitewash or tint is used. This is the basic format we are going to follow. My comments about art and houses in general will be in the larger, black font. The brown italicized font is for comments originating from a specific picture. The architectural record as found in paintings is incomplete. Certain types of buildings get more attention. Cityscapes focus on the great buildings. Rich patrons commissioned works, so their formal rooms often show up as the setting for portraits. Rural dwellings of a picturesque nature are often part of the landscape, to add interest to the painting. In all this the average home sometimes get left out. This article focuses on houses of all types, but will try to avoid the public buildings. Windmills, and water mills, a great subject for artists, will be avoided except where they are presented by the artist as a dwelling. Ruins were a popular subject in certain schools of art, but are for another website to deal with. I will confine myself to houses in art. Here the same artists captures another town. This is supposed to be Bethlehem, but he simply painted what he know, which was Dutch towns. In the distance we can see some of the houses with the clipped gables, but most of the house are either hipped (no gable shows) or a full gable shows. In these the roof generally has a slight eave, but in the house nearest us on the right the wall projects higher than the roof and we have the stepped pattern commonly associated with Dutch buildings. It appears that the houses nearest to us are brick. If we take a look at the windows we see a curious design where the lower 2/3rds or so are protected by wood shutters, but the top part is not. I have never seen this on a standing building and have no idea of the purpose. Before glass was readily available shutters kept out the elements. You might have oiled paper, or thin sheets of horn, but often you just had an opening, with shutters to close when it was cold or nasty. When glass came along the shutters served a new purpose: to protect the expensive glass. 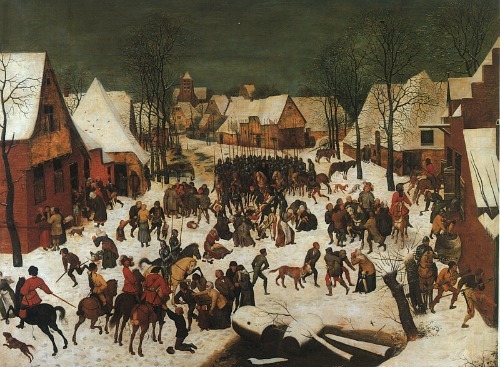 Here is another scene from Pieter Bruegel the Elder. It is called "Winter Scene with Bird Trap". The bird trap is in the foreground on the right, and looks like a board propped up by a stick. 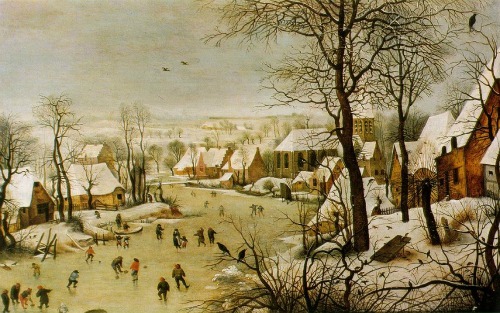 He painted this in 1565. You'll notice that all the artists on this page are Dutch. Different styles of painting grew up in different areas. While the Dutch were choosing themes of everyday life their compatriots in Italy and much of the rest of Europe were painting stories from mythology and history. The settings and background were often fanciful or filled with Classical buildings. The everyday realism of the Dutch painters naturally lends itself to showing off residential architecture, so they are over-represented on these pages. If we flash forward to 1670 we see a different type of house in the same general region. 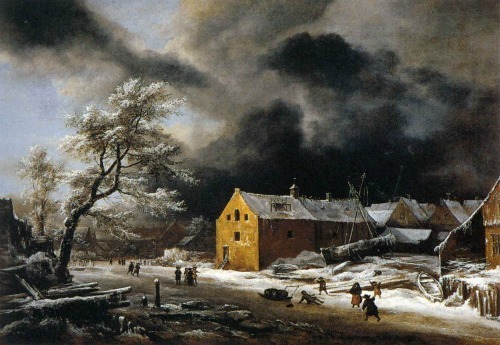 Jacob Isaacks von Ruisdael, like Bruegel, was from the Netherlands. Here the houses have walls extending slightly past the roof. The roofs are wood or tile, but definitely not thatched. There isn't much detail, but we can see that the windows are few and small. Again it appear that the common practic was to go with a natural color for the exteriors. The house on the far right appears to have the roof extended to form a barn or storage area. I continue my study with another page of house exteriors in art as captured by the Old Masters. I will then follow this up with a look indoors. Click on the arrow to continue.